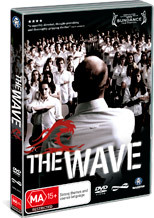 Starring Jürgen Vogel, Frederick Lau, Jennifer Ulrich and Christiane Paul, The Wave is based on a true-story that happened at a high school in the US during the 1960's. This drama movie is directed by Dennis Gansel and involves a teacher named Herr Wenger who creates a political environment in his class room whereby the students re-enact certain Fascist and Dictatorship governments. Ironically as the experiment changes, the students begin to take on their new roles that is quite insightful to observe their changes. Although what begins as a moral experiment soon dissolves into something worse and unfortunately the teacher who is played by the masterful Jürgen Vogel is unable to see the repercussions of his experiment before it is too late. At the end of the day, this movie does have a Generation-X feel to its production and what begins as an interesting premise somewhat becomes lost as the movie progresses, needless to say, it was still a unique and interesting drama that I have not experienced before. Definitely one for those who like to think with their movies.